Nsauditor Network Security Auditor is a network security scanner that allows to audit and monitor network computers for possible vulnerabilities, checks your network for all potential methods that a hacker might use to attack it. 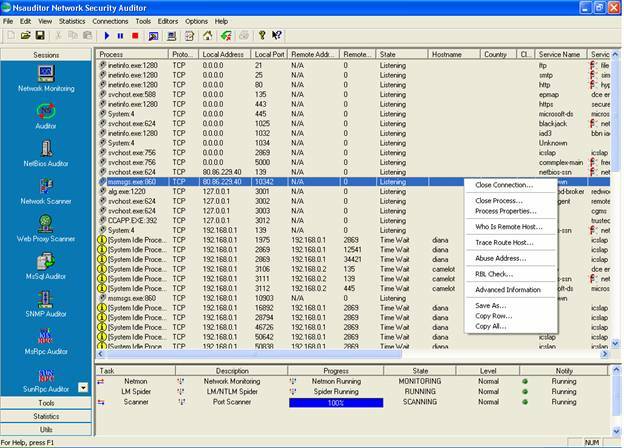 Nsauditor is a complete networking utilities package that includes more than 45 network tools for network auditing, scanning, monitoring and more. Overall, this is a very complete package for a surprisingly low price. Nsauditor Network Security Auditor also includes firewall system, real-time network monitoring, packet filtering and analyzing. Nsauditor significantly reduces the total cost of network management in enterprise environments by enabling IT personnel and systems administrators gather a wide range of information from all the computers in the network without installing server-side applications on these computers and create a report of potential problems that were found. * Network Monitor shows detailed listings of all TCP and UDP endpoints, including the owning process name and details, remote address and state of TCP connections, as well as the host dns name, country , network class, appropriate service name and service description. * This tool allows to perform an audit on a machine running MS SQL server. Qweas is providing links to Nsauditor Network Security Auditor 2.4.6 as a courtesy, and makes no representations regarding Nsauditor Network Security Auditor or any other applications or any information related thereto. Any questions, complaints or claims regarding this application Nsauditor Network Security Auditor 2.4.6 must be directed to the appropriate software vendor. You may click the publisher link of Nsauditor Network Security Auditor on the top of this page to get more details about the vendor.